Halloween is just around the corner so it is time to start thinking about costumes and DIY Halloween costumes are always fun. I like making costumes that are unique, not the same as every other kid that knocks on your door. 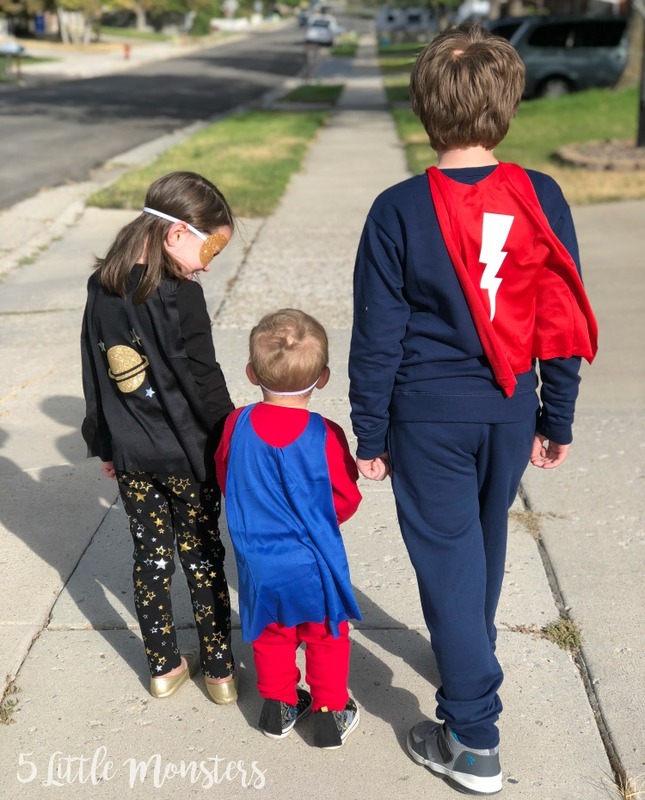 My kids love superheroes, all superheroes, and they each have their favorites. 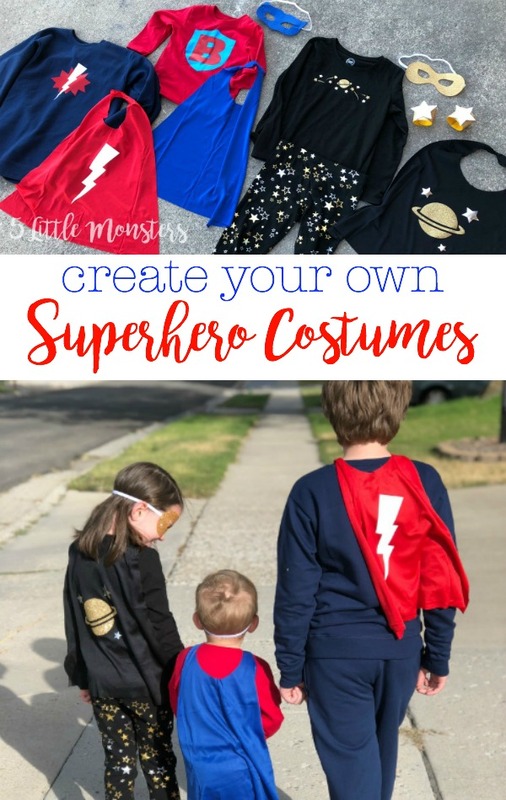 Even though they have favorites I thought that it would be fun to come up with our own superhero and make a Create Your Own Superhero costume. 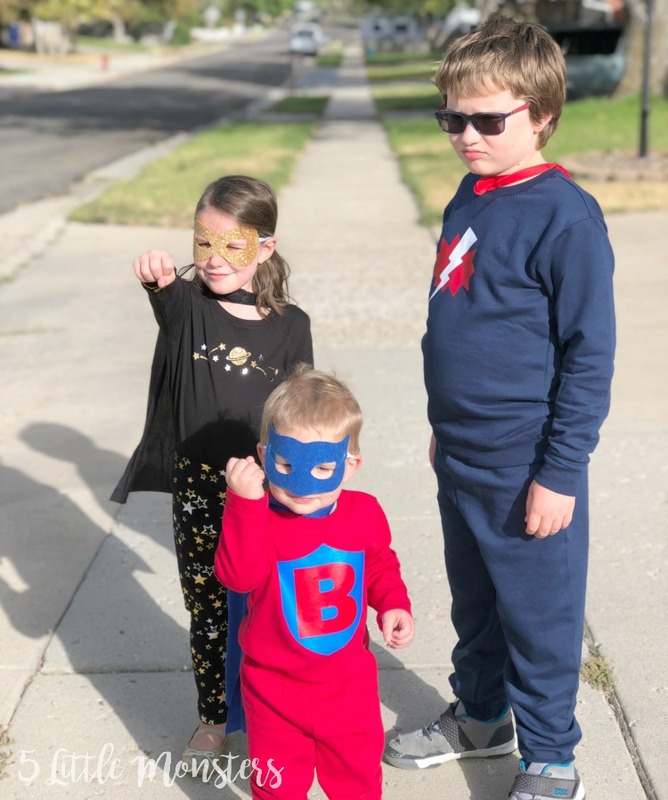 We would come up with some superhero ideas, including costume colors and logos, then based on that we would create our own superhero costumes. 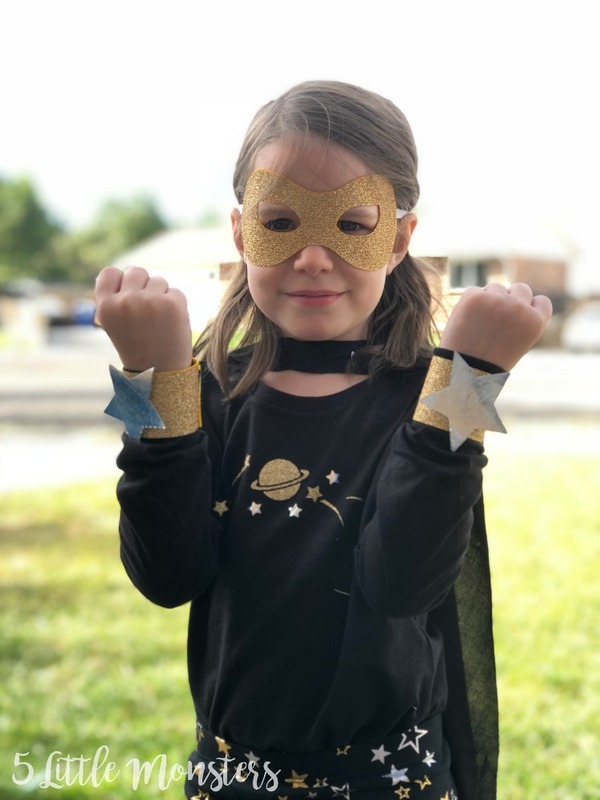 We came up with Super Ben, Galaxy Girl, and The Thunderer. I am going to share how I made our costumes, showing exactly what we did in case someone wants to recreate the same costumes. But more than that I wanted to show how you can take a few simple ideas and turn them into your own unique costume. 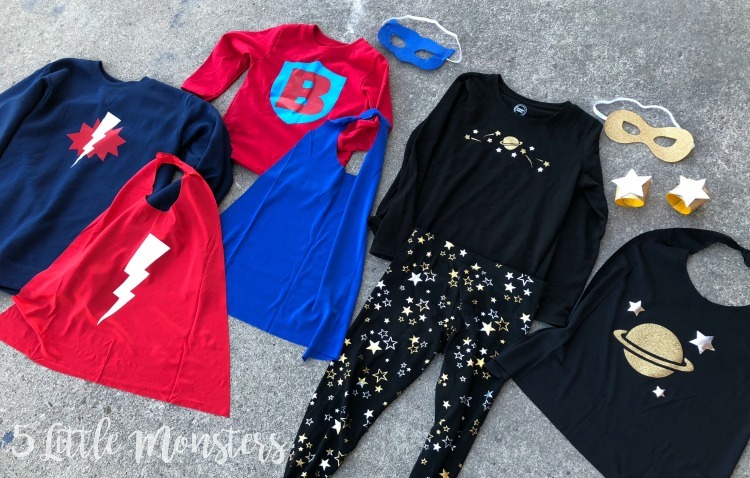 I started with some basic clothing pieces that I picked up at the store, then I cut symbols, masks, and cuffs using my Cricut Maker to embellish the store bought clothing. 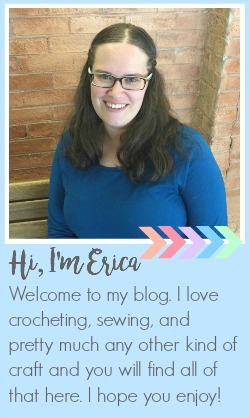 The fact that I could use the Cricut Maker to cut both iron on and felt pieces worked perfectly for this project. The first thing that I did was decide on colors. You could do this by just using your child's favorite color. I based mine on the colors of clothing I was able to find. I started by finding a package of 6 dress up capes (I think they were meant as party favors) on clearance at Walmart. The capes were in 3 colors, black, red, and blue, so I used that as a starting place. You could easily make your own capes, and that is what I had planned to do but when I saw these I figured they would work and make it even easier for me. From there I chose clothes to coordinate with the capes. I didn't want to spend a lot on the costumes so I just looked at inexpensive leggings, t-shirts, and sweats. The nice thing is that some of the pieces will still work as clothing after Halloween is over. 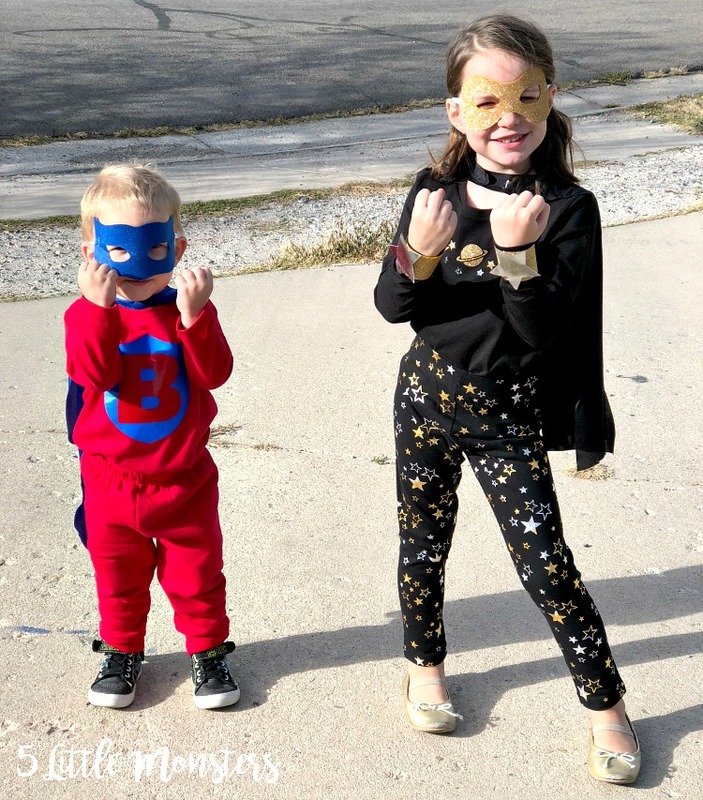 I chose black for the girl costume, and when I saw leggings that had gold and silver stars all over them I thought they would be perfect. I had originally planned to use all solid colors but I thought these would be fun to build a costume around. 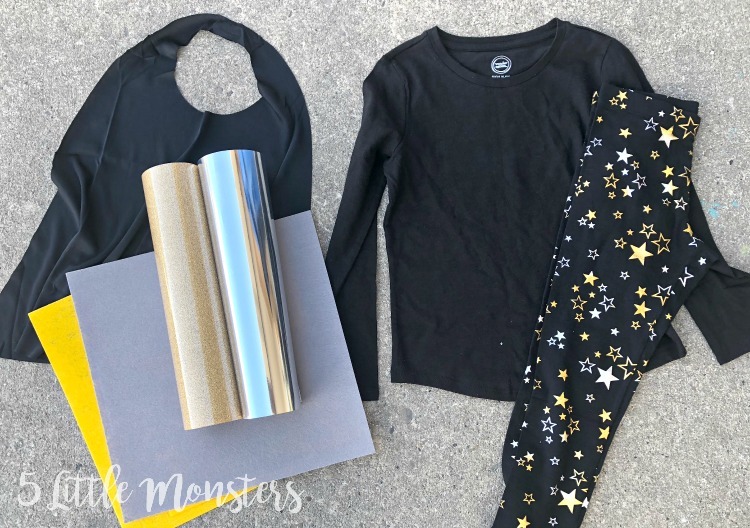 From there we decided that the colors would be gold, silver, and black and since the leggings had stars we wanted something that would go along with that. And so Galaxy Girl was born. We used two different similar but slightly different logos featuring a planet and stars, one for the shirt and one for the cape. We added a glittery mask and cuffs to complete the outfit. 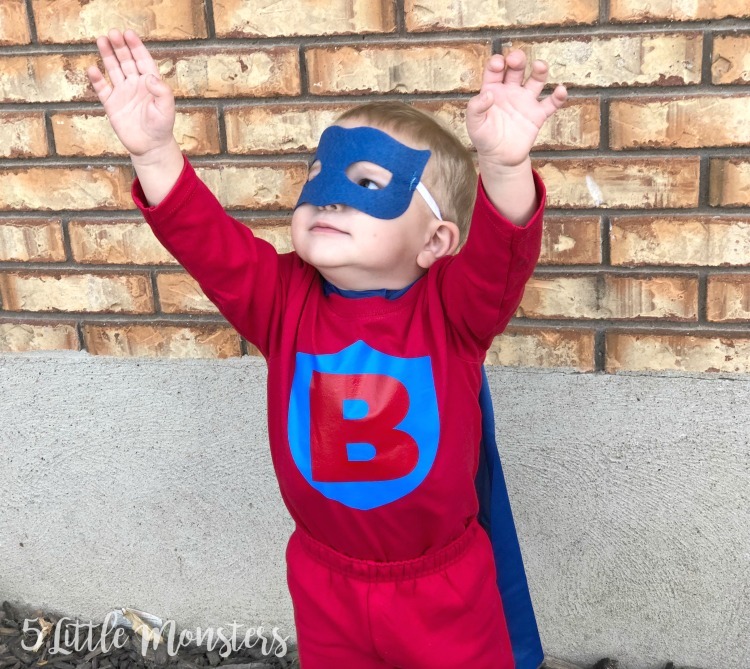 For the first boy costume, Super Ben, we obviously chose to base it around my son's name. He is 2 and is obsessed with superheroes. 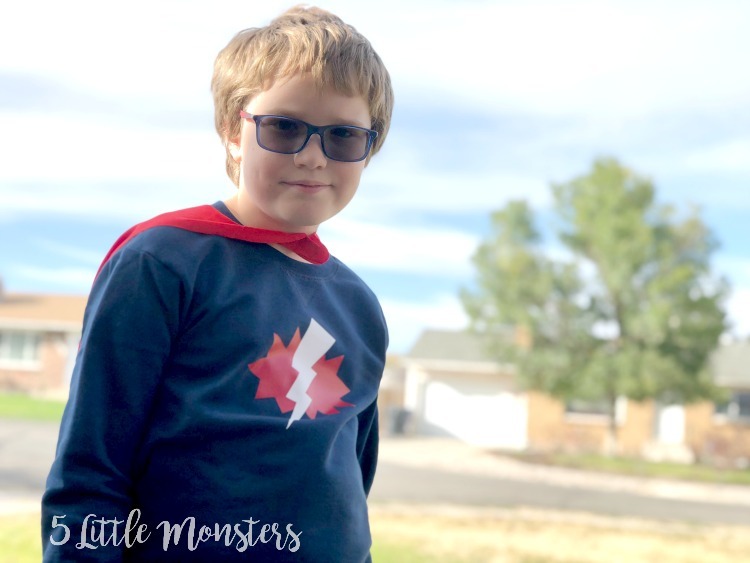 We thought he would love being his own superhero, and we were right, he loves it. For his costume we wanted to incorporate a B for Ben. 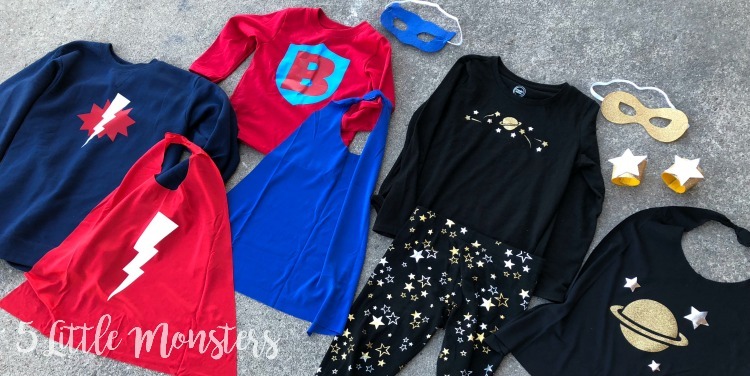 This is a super easy way to personalize your superhero. You can start with any base shape you want, a circle, a shield, a star, etc. Then add an initial on top. We chose blue and red for the colors, and added a blue felt mask to finish the look. I didn't add anything on the back of the cape but we may go back and add a reverse color shield before Halloween. The last costume we made started out with a navy blue sweatshirt and pants and a red cape. From there we just played with some basic shapes and symbols until we came up with "The Thunderer" named by my son. We used a splat, I'm not sure what else to call that shape and that is the name in design space but it looks like the shape behind a boom or pow in comics, then we added a lightning bolt on top of that. On the back of the cape we added a larger lighting bolt. We didn't do a mask with this costume since this child wears glasses. And apparently The Thunderer is a very serious character since he looks slightly angry in all of the pictures, that was just his character pose. They all had a lot of fun running around as superheroes. They wore them for pictures yesterday and didn't want to take them off. Then they put them back on again today and ran around playing together and saving the day. I think they will get a lot of use beyond one time at Halloween. The first step in creating your superhero is to create your symbols or logos. You can use the images I used HERE. To create your own, start with some basic shapes and symbols, circles, stars, lightning bolts, shields, hearts, letters, etc. For letters I think it works best if you choose a simple bold font but you can play around with different options. You can layer different images on top of each other to create the design you want. Once you have your image you can decide if you want an image on both the shirt and the cape or just one or the other, and if both then whether or not you want them to be the same or different. For example the Galaxy Girl shirt and cape use the same planet and stars but in different sizes and configurations. The Thunderer cape has only a lightning bolt and it is larger than the lightning bolt on the front. I chose not to put anything on the Super Ben cape but if I did I would have either reversed the colors so the shield was red and the B was blue, or only put a large red B with no shield. Once you have your iron on designs ready you need to decide on other accessories. 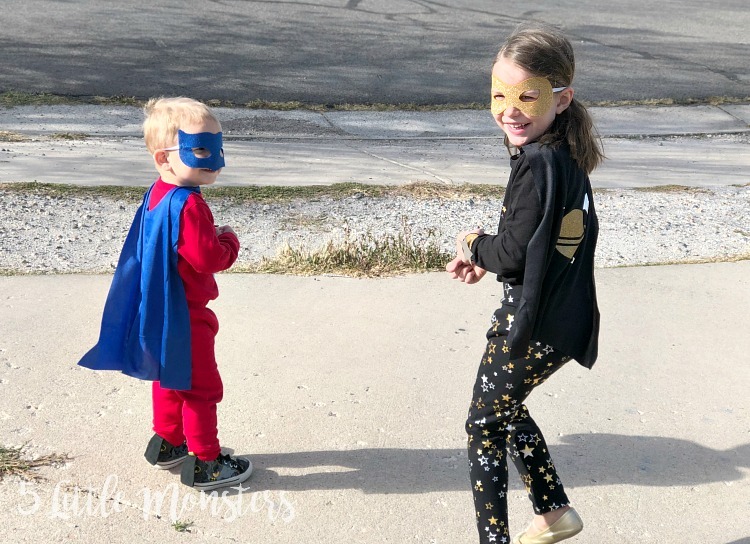 In my Design Space file linked above there are a couple of masks included that I got from Design Space, I also have a post from a few months ago where I made a few slightly different versions of superhero masks and you could use those as well. To make the masks I cut them out of felt using the rotary blade to cut them. Then I stitched a piece of elastic to the sides of the mask. For the glitter mask I also cut one identical mask out of glitter iron on and pressed it onto the felt. To make cuffs, or bracelets as my daughter calls them, I just cut a rectangle of felt. I measured my daughter's wrist and added a little extra for overlap and also to accommodate the shirt sleeve underneath. Then I made it a couple inches wide by the necessary length. I cut one out of felt and one out of glitter iron on and pressed that onto the felt. I also cut out stars out of felt and and foil iron on to attach to the cuffs. Velcro is stitched along the short edges for closures. Cut out all of your pieces making sure to use the correct setting for the different materials. All felt was cut with the rotary blade. Press the designs on the shirts and capes. Press the glitter iron on onto the felt masks and cuffs if you are using it. Sew the elastic onto the edges of the masks. Sew velcro on the short sides of the cuffs. I used sticky velcro dots to stick the felt star onto the glittered cuff, hot glue would work as well. Put all of the pieces together and become a superhero. It was really fun and easy to put together these semi handmade Halloween costumes, and I think we will get a lot of use out of them.